This past weekend at First Appearance, we had the chance to attend Gem City Comic Con. There we were able to meet creators from here, there, and everywhere. There we were able to meet Jack Wallace, the head writer and publisher of Disposable Fiction Comics from Columbus, Ohio, who introduced us to a very unique comic, A Matter of Perception. I consider myself open-minded to everything that crosses my path and I admire anyone who gets to publish their work. 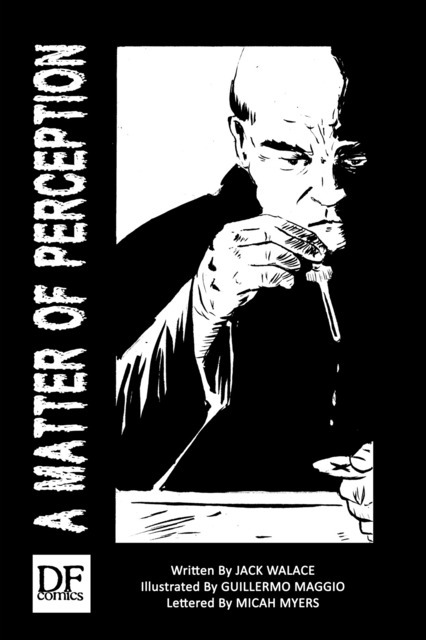 A Matter of Perception is a black and white tale set in the 60’s where a priest is struggling to get people to join his congregation. He resorts to drastic measures to convince his flock of their need to become good Catholics. The whole matter of perception is, did he do the right thing? He something questionable that got results. The priest questions himself and puts himself through the same “therapy” to see if it’s faith, an act of God or just the games our minds play. Is our perception altered by God or something more chemical? A Matter of Perception obviously isn’t a super hero book in any sense, but it’s a solid story designed question our lives whether we are religious or not. Guillermo art is sketchy, but has an excellent use of lights and dark. I wish there was more detail, but that’s always my perception. The tale certainly is intriguing and thought-provoking, the perfect original creation you hope to find wandering around at a convention.